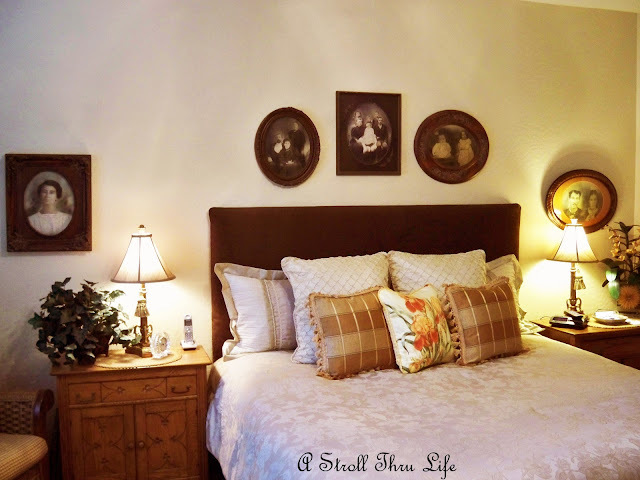 Several of you have asked about the pictures I have in the bedroom. When my mom passed away many years ago, I found these old pictures in a chest. I had never seen them before and didn't know anything about the people. My mom had a note on the back of each one, however she wrote things like Aunt Maude, Uncle John and family and etc. My dad didn't know the story of any of these people, however since they are ancestors I asked if I could have them. A couple of them were in frames and I found antique looking frames for the others. This one simply says Aunt Maude. This is one of the frames I found, not an antique, but it works well. This one says Mother's Aunt Alice. This is also one of the frames I found. This one says Uncle John and family. It was framed this way. This one says John and Mollie. My mother had a brother named John and a sister named Mollie. They were both quite a few years older than her, so I think this is her brother and sister. I found this frame also. This says Grandma and Grandpa. It was in this frame with the curved and bowed glass. (Sorry for the glare). I wish I had seen these pictures while she was alive to learn more about these people, but I cherish the pictures anyway. These would all be great or great-great ancestors. Thanks for stopping by, I always look forward to your visits. Be sure to link up tonight to Table Top Tuesday. You guys always inspire me. Since I'm a genealogy buff I would say just start working on your family tree. Start with Ancestry.com. You would be surprised at what you can find on there!! Marty, my sister and I found family portraits of people who we can't identify either, and there wasn't even a note or name on the back. Like you, I wish we knew who they were, but we cherish them all the same. I love all of the wonderful frames you found and how beautifully you have them displayed. What precious heirloom family portraits that you have! 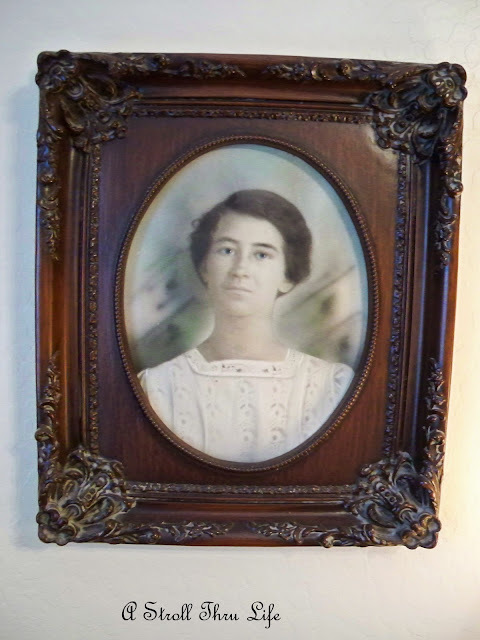 Your Aunt Maude's portrait is similar to one my Mother had of my Grandmother (her mother) from the early 1900's! Mother had all of her old photos(unframed) in the cedar chest. When I was engaged, she emptied the cedar chest to give to me. 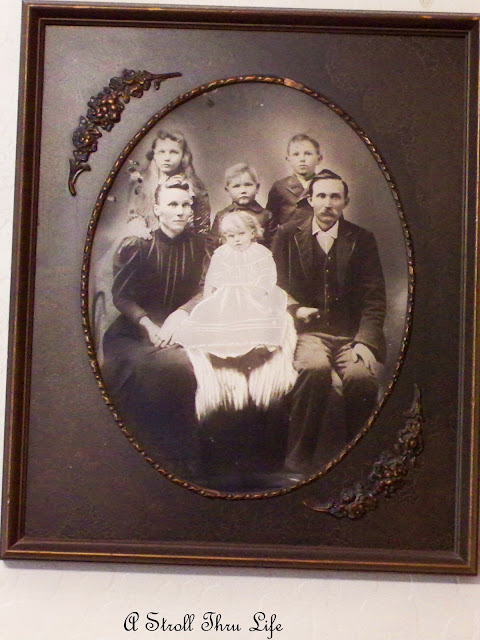 She identified the family to me; however when my dad re~married (after her death), the photos were given to my sister. Sad how things sometimes happen in families. Thank you for this heirloom post. I have a few pictures about this old inside an album. They are treasures indeed. I do know who they are, and I've labeled them for future owners. Have a nice week, Marty, and stay warm. Neat old photos and neater yet that they are related to you. I love that you have them displayed so nicely. Marty, I have so many pictures like these of my family... Aren't great to have? I'm so happy to have them, not everyone can say that.. They are truly wonderful and with some searching I imagine you could learn more about them. How wonderful your rescued them! They all look great in your bedroom. It is so special that you saved these. It's so cool to have something like that. I'll be back tomorrow to join your party (I re-vamped some vignettes over the weekend). I am hosting my first party on Wednesday. I hope you will join in on the fun. Thanks. I LOVE old pictures- and even if you don't know the whole story behind them, it is fun to imagine what they may have been like! Marty, as someone who is very much interested in genealogy and family research, I think these pictures are truly wonderful. You've done a fantastic job of finding antique looking frames for them. Have you thought about trying to research who they were? Love this post and love your blog. I stop everyday and get in a hurry and don't tell you how much I enjoy the time I spend here with you. I love those old pictures. There's nothing quite like having those family heirlooms! Marty, I've just seen a new use for silver trays and I thought of you. You must see what Andrea @ Opulant Cottage has done using trays on a towel rack in her bathroom remodel. She posted it with Susan for Met Monday @ Between Naps on the Porch. I know you'll love it as much as I did. Did you have a good weekend? I hope you had a wonderful time! This is interesting! I really like the idea of using this kind of frames and displaying them. Beautiful and meaningful, Marty. I can't believe your too alert with all your projects. I just drool what your treasures are. Everything is just too pretty old or new. BTW, did you received a parcel from Sweden? I was thinking it's been 4 weeks now, but I never heard from you. Parcel wasn't special but I just want to know if you get it. Let me know. Happy TS... I have mine up now, but I will link on yours tomorrow when I wake up. These are just beautiful, Marty! How you must treasure them. Isn't it something how back then it was so serious an occasion to have a portrait made? Marty, your pictures are wonderful! 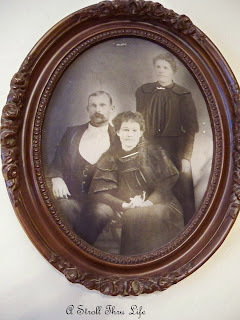 I have many old family photos too, and since my grandfather is fortunately a geneologist, we even know who they are. I am so jealous of your fabulous frames. They're gorgeous! Love the way you've displayed them too! Love love love the photos. I hope that you will be able to dig up some stories to go along with those photos! Great pictures! 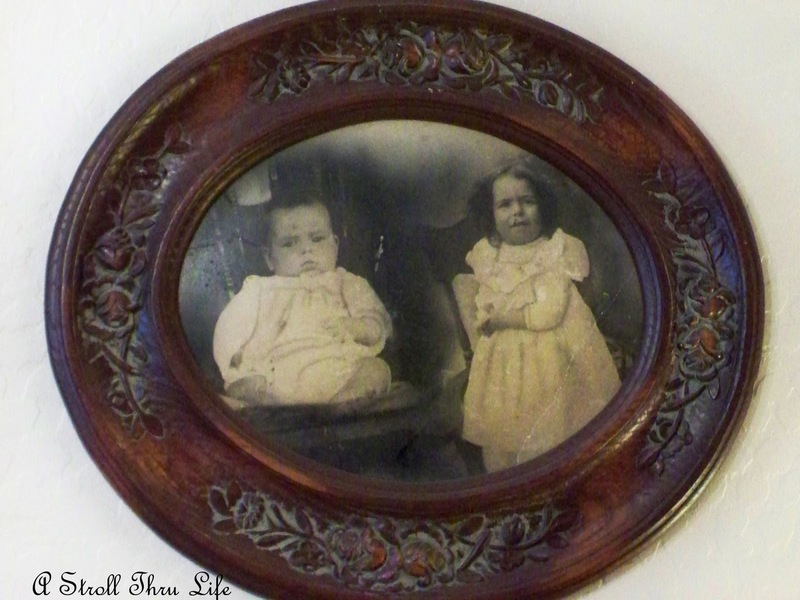 I am a geneaology freak and I've been hoping for years to get my hands on real photos of my ancestors...but no such luck! Love the beautiful frames too! I'm hoping that when my great aunt passes she will give me my great-grandparent's framed wedding portrait that she has in her house. I don't think her sons have interest in things like that. Lucky you to have them! What treasures! It's important for us to be sure we have labeled our photos so our kids and grandkids will know who they are. I have some wonderful family photos and my dear, little mother has quite a few. 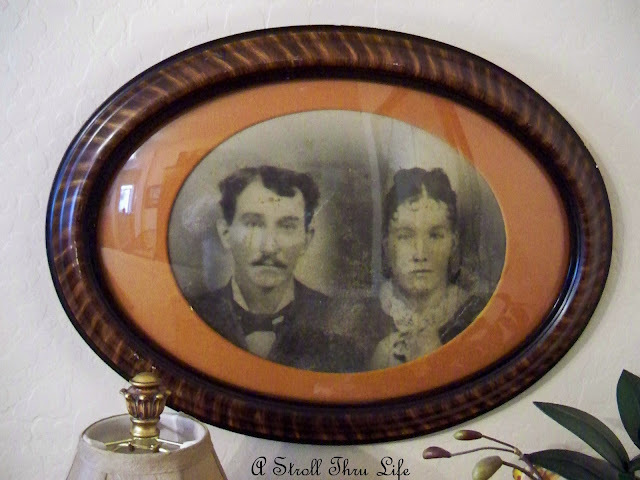 I love old family photos and yours are beautiful in the antique frames! I just love old pictures and frames! I have most of my mom's too. I was lucky enough for her to allow me to go through them while I was growing up so I know who a lot of them are but there are still many more that I don't know! Those frames are just gorgeous and what a history! I have always loved looking at pictures just like that in my grandmother's house. They make great art! Everyone is so serious - so different from now a days.